Thoughts, tips, and questions on sculpture methods. Caproni casts are signed at the back or side, as this one is, and casts from original work by neoclassical sculptors also bear the sculptor’s signature. Once ubiquitous in schools and on parlor pianos, they sometimes turn up in antique shops. The original, 19th-century showroom was in downtown Boston, and founder Pietro Caproni traveled the world taking molds from ancient and contemporary sculpture. Took a great introduction to blacksmithing class at Prospect Hill Forge in Waltham this weekend. It was about 10 degrees outside, but I warmed up right away making my first project, an S-hook. Prospect Hill Forge offers classes for all levels, and hosts an open forge on Saturday mornings for those with a bit more experience. I dropped off a wax at the Green Foundry in Eliot, Maine last week. There is a lovely sculpture show on the grounds, which is adjacent to Sanctuary Arts. I was reminded of foundry days at Andrew DeVries‘s River Studio, where my early work was cast. I went to a demonstration of 3D printers recently, and ended up thinking about this photograph of Gwen Lux in her New York studio sometime in the 1940s. Lux is seen enlarging her sculpture for Rockefeller Center using a pantograph, the assemblage of pipes above her head. 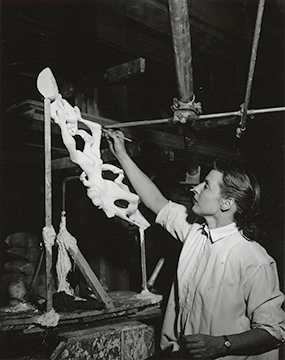 While the Juley Archive of the Smithsonian houses this and other photographs of Lux with her sculpture (both maquette and full-scale versions), her pantograph is only visible in this shot. A construction of metal and pipe, rigged on a boom near the studio ceiling, it basically worked just like the child’s toy that many of us used to make copies long before the existence of desktop 3D printers. 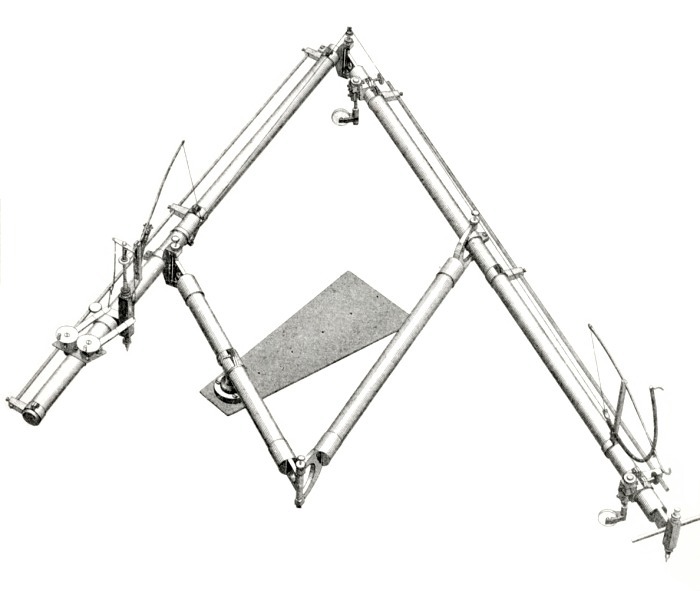 The pantograph’s basic design is simple: four bars linked together in a parallelogram shape. By tracing an object or drawing with the pointer end, the pantograph traces a larger or smaller image depending upon how one adjusts the pen (or pencil) and pointer. Wikipedia says that the device was first created by inventor and steam pioneer James Watt in the 18th century, but other, simpler versions were in use by artists in the Renaissance and probably before. Watt’s version was perfected by Benjamin Cheverton (1796–1876) in 1836. Cheverton’s machine was fitted with a rotating cutting bit to carve reduced versions of well-known sculptures. Another version is still in use to reduce the size of large relief designs for coins. 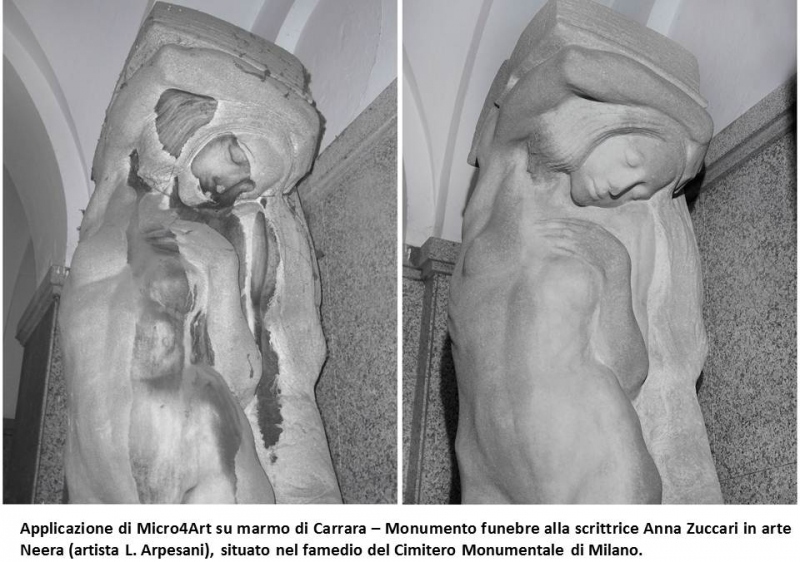 Acid rain is the bane of outdoor sculpture in many parts of the world, but a new product made of sulfate-reducing bacteria shows dramatic results in this Florentine cemetery…read on! 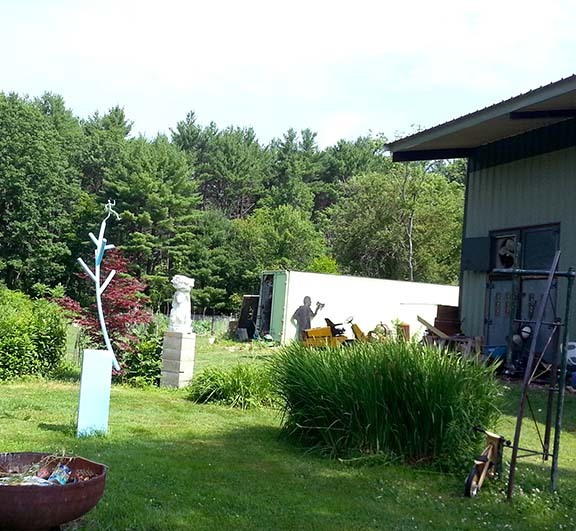 I recently met with two members of my sculpture group, Joyce Audy Zarins and Eleonora Lecei, at Eleonora’s house and studio for a day of outdoor raku. We glazed our bisqueware and heated it in Eleonora’s smaller electric kiln, which she’d placed outdoors. When the glaze was molten, we fished the pieces out with long metal tongs and deposited them in a steel drum that had been filled with a mixture of shredded newspaper and sawdust. Once the sawdust caught on fire, the chamber was covered and left to smoke like a captive dragon. 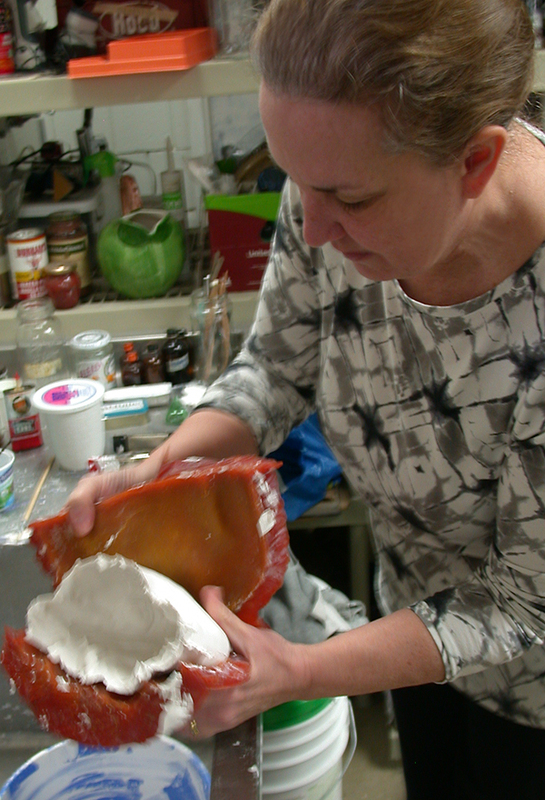 Eventually, we pulled the finished pieces out again and sprayed them with water until they cooled. 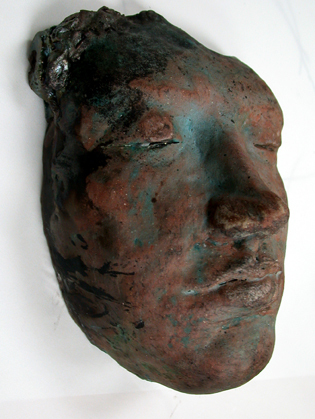 I used a combination of colors including copper metallic glazes on this head. The result is a finish like tarnished silver that still shows the red earthenware underneath. 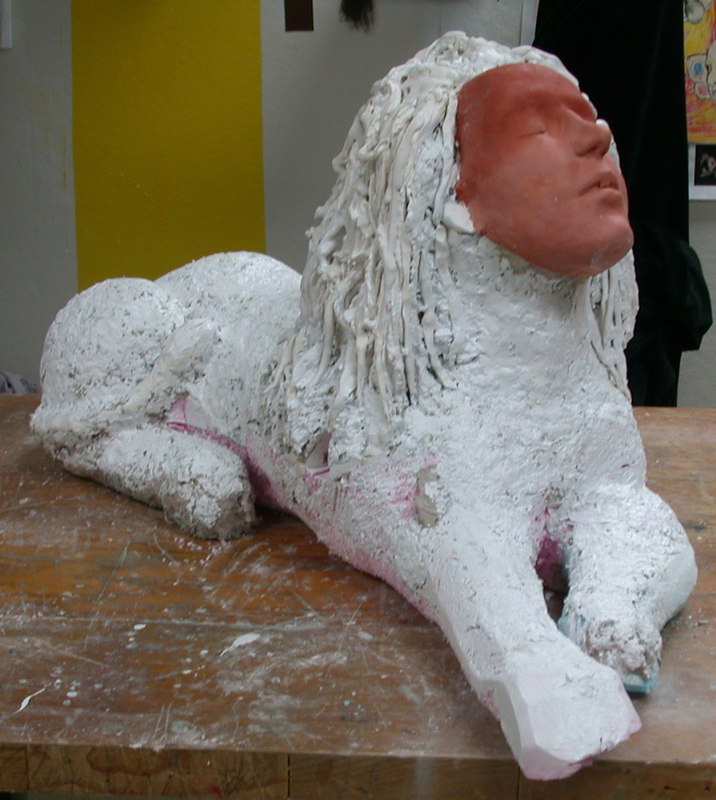 I’ve been working on “Sphinx” for a few months now. It’s lifesize (for a sphinx, I guess), and is paper mache and plaster over foam (you can see the Pink Panther-pink bottom edges where the laminated foam chunks show through). I’m trying to get away from making so many molds! Right now I’m wrestling with the question of whether or not to add a ceremonial beard, worn by both male and female rulers in ancient Egypt. Am leaning toward the beard, then a final texturing and coat of wax. See this live and in person at Open Studios tomorrow! Cast metal with your microwave! Has anyone done this at home? I’m going to try casting tin solder as soon as I can get a microwave-size refractory rig set up.